The planet Jupiter is the largest of all the planets in our solar system and is the fifth planet from the Sun. It is considered a social planet and is the ruler of Sagittarius. Jupiter governs the ninth house in a horoscope chart and is considered to represent the expansion of mind and body. Astrologically in your horoscope chart, Jupiter represents expansion as well as opportunity. At an intellectual level Jupiter rules the expansion of one's interests, education and scope. At the material level this planet rules the expansion of your possessions, be it money or investments of any kind including other forms of material goods. At the physical level, Jupiter rules the overall sense of well-being and provides a beneficial (healing) influence in case of illness. Organically this planet rules the liver and the spleen, the fatty deposits in our body (cholesterol). 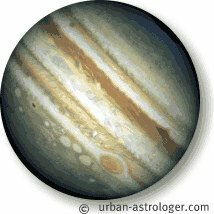 At the personality level Jupiter rules broadmindedness, a live and let live attitude, benevolence, generosity and joviality. At the Social Level Jupiter rules the status that follows higher levels of education and the professions - all matters pertaining to the ninth house. When it comes to locality astrology - also referred to as relocation astrology, each planet has very specific influences. The various parts of the world that reflect your Jupiter destiny points can be looked at to understand this planet's positive and expansive energy in your life. Traditionally the planet Jupiter is know as a beneficial planet and the area of your birth chart that houses this planet will often show greater opportunity. An awareness of how this can work for you helps you take advantage of opportunity when it comes knocking at your door. In Jupiter, we find the great ennobling influences, the broad-mindedness, the ability to consider others, the universal consciousness that are part of the entity's unfoldment. Jupiter is the planet of career and life direction. One of the ancient words for Jupiter is 'guru' and Jupiter is, literally, the guide as well as the path we take through life.Your Personal Jupiter Forecast will show you how the planet figures in your natal chart and your outlook for the immediate future. Jupiter is the planet of expansion. International travel. Faith belief, the religious impulse. Higher education. Law, philosophy, ethics. If you want to have a quick look at how this will show in your chart you can check out our free horoscopes page which will give you a taste of astrology and how this planet works in your chart. In addition, the position of Jupiter in your horoscope chart describes how you grow and evolve in the relative area of your life. The house position of Jupiter represents your desire and your search for meaning in your life. As the planet Jupiter continually moves around the zodiac it passes over every area in your personal birth chart. As it touches different areas in your birth chart, it is a time to take advantage of opportunities in those areas of life. Knowing when and where to look for those opportunities is the ongoing gift that Jupiter can offer you.